I had a great day yesterday...I met one of my French blog readers, Christelle. She has lived in the US and speaks wonderful English. My head is reeling with all that we talked about and I need to make of list of all the things I want to ask her because we definitely have to get together again. We met for coffee at the Louvre Starbucks...I know...that sounds like a funny combination...American coffee joint at a world-famous museum. At least there isn't a McDonald's there. But there are some great shops underneath the Louvre, to include an Apple Store and Swatch shop, so I got my first Christmas present purchase out of the way. No huge shopping crowds on Nov. 29th in Paris...what a relief! We then made a trek to a Bernina shop so I could find out about getting a European power cord for my machine. I had been putting off that chore because I had no idea how to communicate all that on my own...in French! My Alaska Bernina techie is insistent that I get this cord instead of just relying on the after-market power adapter. But after taking a picture of the cord at the Paris store and looking again at my machine I can see it's not going to work anyway. I will save myself a big chunk of change as the power cord is pricey...more money for fabric. I'll share more about my visit with Christelle in the coming days. I want to share quilting news. I've been busy...not eating Thanksgiving leftovers (darn...I miss those!) or shopping...but sewing. One of my goals this year is to make quilts that I have designed instead of working on the designs of others. My husband is back in Alaska for a few days so I can devote a lot of hours to quilting. Somewhere along the way...at least two years ago...I was inspired by some batik fabric with humpback whales to tackle a Storm at Sea quilt. I'm using templates from Marti Michell. They are so tedious to use when cutting everything out but they sure sew up nicely. All my units look so perfect. I have been keeping company with a couple of great audible books...I should share some of those too..but I'm going to get back to sewing. What a sweet little top! It will now go in the pile to drag back to Alaska and quilt next summer. It's going to be a difficult one to quilt with all the applique to outline...might be cursing myself...but I have had this Nancy Halvorsen project in my stash for soooo many years! There is a trucker's strike today...which means at some point...probably during rush hour...trucks will block all lanes of traffic on the highways around Paris for a little while. So my husband is working from our apartment today and not driving into work. Fun for me. I had someone to shop with at the Thursday market. Only thought to get a photo at our last stop, the Rotisserie booth. Potatoes line the bottom shelf of the rotisserie oven where all the meat juices drip on them as they cook. On the table you can see the containers of roasted potatoes with all the meats ready to go! We bought one small roasted chicken (to the left of the potatoes) for 12 Euros...equivalent to $16 US. I'd much rather have a roasted chicken from Costco for $5 but it beats cooking. We also picked up two roasted sausages which I plan to use in black bean soup with my stash of Rotel tomatoes. It would have been much cheaper to buy a chicken leg and thigh for only $1.60 Euro but I'm a white-meat lover so we have to pay the big bucks. Got a little work done on a stocking. Hubby was working late so I watched a few episodes of "Game of Thrones," season I. I have only managed to see a few of the the season III episodes on my flights between Paris and Anchorage. I was so frustrated to start reading those books and then find out the author still has two more to write. I hate being left dangling for years! I officially finished two stockings...I'll have some Christmas decorations for the Paris apartment. Almost time to start putting those up! I love the chair Santa is sleeping in...and of course the quilt on his lap! My husband and I always loved the Wizard of Oz movie...to this day we sing along when the movie is on television...that must be why our kids hate that movie! First off...I finished two more cross stitch ornaments. I'm trying to get organized and finish a few Christmas items. I brought back felt yardage so I can finish putting together the stocking tops I completed last year. And I've been playing in EQ7 with some layout ideas for these blocks I finished last year too. My new design wall in Paris is a Fons and Porter product. It looks like a gridded, flannel-lined shower curtain. The grommets are not set at level lengths so it was eyeball mounting of the hooks. It works! I often feel my life has been one serendipitous event after another. Serendipity...that word comes to mind so often lately. I looked it up for an official definition. According to Wikipedia - Serendipity means a "happy accident" or "pleasant surprise"; a fortunate mistake. Specifically finding something good or useful while not specifically searching for it. The word has been voted one of the ten English words hardest to translate. If I ever rename my blog it will have to involve that word...Serendipity. 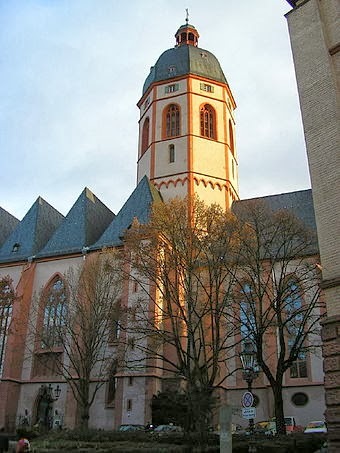 A simple visit to a rather small church in Mainz, Germany can really set one to thinking about a lot of things. Opening the door to walk inside St. Stephan's Church I was at first surprised to hear a mass taking place. I had checked the church's schedule ahead of time and thought I had come well before the first mass scheduled for the day. The priest was starting communion so I decided to sit in the back row of pews and wait to walk around after the service. This church has a beautiful pipe organ...and it over flows the space when it is playing. Every....every single window in the church is predominately brilliant blue in color. With the sun shining outside the colors of the windows was intense. I was quite envious of the people who regularly worship in this beautiful place. My poor iPhone just can't handle photos of backlit windows. I don't think photos could capture the what I saw or felt anyway. I borrowed a few photos from the Mainz website. This is wonderful photo because it captures the blue cast the interior of the church has from the colored windows. Marc Chagall, a Russian Jew who pursued his art in Paris from 1923 to 1941, often dealt with religious subjects in his art to include Christian symbols. He was a contemporary peer of Henri Matisse and Pablo Picasso. With the Nazi occupation of Paris, Chagall fled to America. How did Chagall come to create the windows for St. Stephan's Church in Mainz, Germany? According to an historian of Johannes Gutenberg, John Mann, Mainz was once the "capital of European Jewry," containing the largest Jewish community in Europe. Starting in the 9th century, many Jews traveled up the Rhein river to settle in Mainz. In the 10th century there was a "golden age," with Mainz serving as a central area for learned rabbis. With the turn of Christianity to the Crusades the Jewish population started to experience the violence of religious hate which plagued the Jewish people for most of the following centuries, leading to the ultimate devastation of the Jewish Mainz population during WWII. Most of Mainz was heavily damaged from bombings in WWII and the rebuilding of the city spanned into the 1970s. The Monsignor of St. Stephan Church was a friend of Chagall and he approached Chagall about creating windows for the church which was mostly destroyed from the war. The collaboration of the windows was done with the hope of building and showing support for Christian and Jewish relationships in Germany. 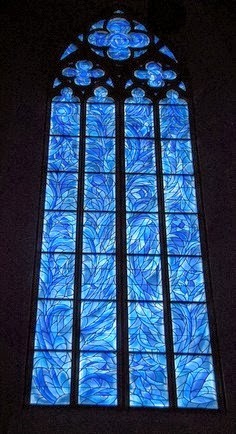 Chagall had created windows for several churches in other countries but this is the only German church with his artwork. 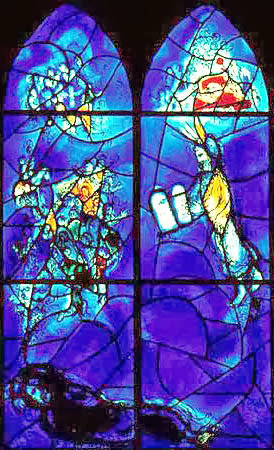 At the age of 91, Chagall created the first of nine windows in 1978 and his last with his death in 1985. The rest of the windows with a simpler look that line the main body of the sanctuary, were completed by another artist who had worked with Chagall for 28 years, Charles Marq. I have never had a great appreciation for most modern art...I find modern art always needs explanation. It looks effortless...like it took no skill to throw together. I remember Chagall from my Freshman Humanities class but it wasn't until this summer when I "stumbled," onto a Chagall exhibit while checking out the gardens around Luxemburg Palace in Paris this summer that I learned about the use of brilliant blue that he introduced into his work as a result of his living in Paris...and the color came to dominate his later works. 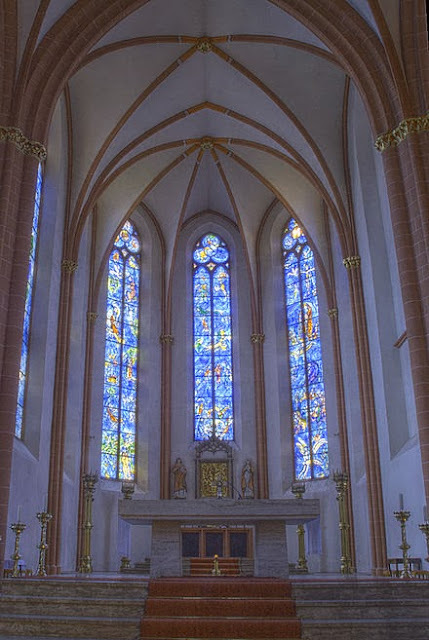 The official descriptions of St. Stephan's church emphasized the blue color's feeling of tranquility and peace. I definitely get that peaceful feeling being surrounded by that blue color. Looking through the eyes of a 50-something person is quite different than an 18-year-old. I have a lot to think about...and thankfully...mostly about the many wonderful surprises I have...almost everyday. It pays to do a little internet research every now and then! When I checked out the Mainz tourism page I found out the most prominent historical figure from Mainz was Johannes Gutenberg. Wow! I felt vey silly because I have walked by the museum several times and never noticed it before...I think the modern exterior didn't grab my attention. Publishing was my career field a long time ago (pre-children). I am not kidding when I say I was thrilled to see this museum! I did the audio tour which was excellent. Right away the tour brought me a vault where the museum stores a prized two-volume set of the Gutenberg Bible. The room is kept dark...I'm sure that is to protect the parchment from light. I downloaded these photos from the museum's website. 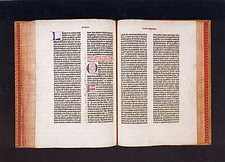 The Bible was printed in the mid 1450s. The museum's copies are called the Shuckburgh Bibles, named for the English family that originally owned the set. Any colored areas were added by hand after the black type was printed. Holes were left in the copy to add the red lettering by hand. Some bibles had much more elaborate colorings added. It is really incredible to think about how the ability to print using moveable typeface revolutionized the world. It was a major component of the religious Reformation. Being able to print discussion about religious topics for use by the more common man was key to the distribution of differing religious thought. In a little over 500 years we have leapt to an ability to watch typeface set itself instantly while working on a laptop. I can remember using an Exacto knife to cut and paste newspaper copy when editing a newspaper twenty-plus years ago. Wouldn't Gutenberg love to see how his creation has evolved! I'm so glad I live in this time period! Today I am venturing to St. Stephens Cathedral where there are colored windows design by Marc Chagall. Yesterday it was cloudy...not good to stained glass window viewing...today it is sunny! We arrived in Mainz, Germany, yesterday via six hours of train transportation...most of it actual train time and very little connection time for the one transfer we made in Cologne, Germany. We are staying at Mainz City Hilton which is a hotel my husband has been laying over at for airline trips for twenty years! I think they know him here. This is my third trip. I enjoy this little part of the world. The hotel is a block from a nice shopping area surrounding Mainz Cathedral. 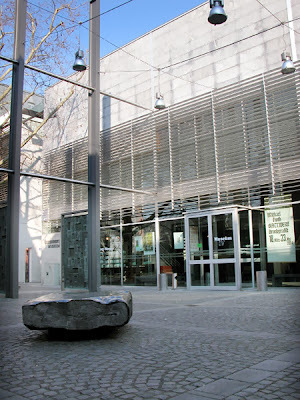 There are small, boutique shops and large department stores and we are just a few blocks from the Rhein River. 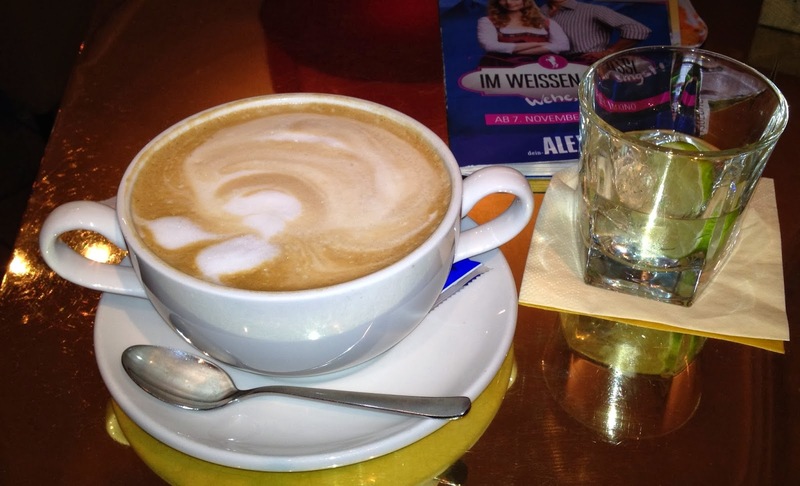 For a little afternoon pick-me-up we stopped for a beverage. I ordered a cafe au lait, a bit like a weak latte, and hubby got a splash of vodka. I had to take a photo because my coffee drink was definitely "biggie" sized...it required two handles! After meeting with a few Fed Ex pilots laying over at the hotel we went to our favorite restaurant, the Heiliggeist, or Holy Ghost. 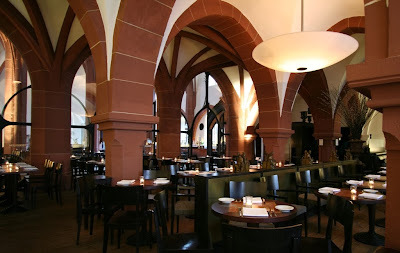 The former church has been converted into a lovely restaurant with authentic "cathedral" ceilings! I think we could just order appetizers and soups the next time we come for I find these items the most interesting on their menu. This restaurant offers their menu in English which is a nice treat since I don't know much German. Our first course, an avocado and goat cheese appetizer with olive and lemon oil vinaigrette. You scoop the avocado concoction on to the endive leaves. Yummy! Then we had a soup. Tomato-essence with basil and parmesan crullers. I love the way they present the soups at this restaurant. The soup bowl is brought out with a few items on it...my bowl had some chopped tomato and basil with the parmesan "dumplings." Then they pour the soup-base on top. In this case it was a clear broth. This unassuming bowl of soup was so flavorful! Hubby had marinated beef with potato dumplings and brussel sprouts. I had the pork filet rolled in bacon with morels, fried tomatoes and tagliatelle (pasta) with wild herbs. Their entrees are generously portioned. When I announced I was done eating my husband inquired if I didn't like the pasta...I said I loved it and ate half of it but there was still a huge portion left so he was confused! There was a little excitement last night at the Paris airport for Fed Ex so hubby is going back to Paris today. I'm staying in Mainz and waiting for him to rejoin me tomorrow. I will have no trouble entertaining myself with some shopping later today. I'm very comfortable getting around town, especially since most folks speak wonderful English. It's a friendly little community. I've arrived back in Paris. As usual...I've gotten a couple of cross stitch ornaments well under way with all the air travel between Alaska and Paris. I finished Plymouth Santa. I've gotten to my favorite part of construction on Jamestown Santa...adding the beads. I've been very forgetful about taking photos as I've gotten back into the swing of hanging out in Paris. Tomorrow we take the train to Mainz, Germany which is a nice little community outside of Frankfurt. We went there twice last year and I am looking forward to going again. This time we are going to stay two days past the conference so my husband will actually spend some time with me being a tourist. I usually have to entertain myself and then we rush back to Paris once a conference is done. But this year we are trying to enjoy our travel opportunities a little more. Our French lessons last year took a lot of my husband's free time. I'm officially done with formal classes...out of money and inclination. I get by with my "pigeon French." When I was in Alaska my husband spent most of his time working on his French lessons. He can be my interpreter when I get stuck! My first morning here I had to go to the Saturday market. It was soooo busy! I was a bit overwhelmed being around so many people again. I brought so much work for my sewing room that I could easily stay busy in it for the next six months...I will have to force myself to get outside everyday!